Kangertech’s latest device is the all-in-one, temperature control CUPTI Starter Kit. 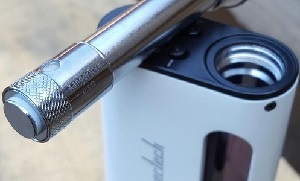 The CUPTI is based on Kangertech’s first temperature control device, the NEBOX. Kangertech did address the leakage problem that the NEBOX had. The internal tank has a 5 ml ejuice capacity. You fill the tank by unscrewing tip and coil connector assembly and lifting it out of the mod. Shoot some ejuice into the tank, being careful not to go past the “MAX” line, and replace the coil connector. In TC mode the display will show a battery meter, resistance of your coil, maximum wattage of 75 watts, selected coil material, selected temperature and scale. When you’re in variable wattage mode the display shows battery meter, resistance, voltage and your selected wattage. Features: Kangertech gave the CUPTI a pretty decent set of features. It’ll fire a wide range of coils in TC mode and has a maximum power output of 75 watts. Two coils are included with the CUPTI, a 0.5 ohm Stainless Steel CLOCC and a 1.5 ohm Nichrome CLOCC. CLOCC stands for child lock organic cotton coil, and they’ll also work with Kanger’s CLTANK and EVOD-PRO. Kangertech will also release an RBA for the CUPTI, the CLRBA, shortly after the CUPTI hits retail. I like the placement of the LCD on the top of the device, it makes it easier for me to see it as I’m vaping. And the power adjustment buttons being up there on top as well makes it very difficult to change your setting accidentally. The CUPTI is available in white, black and red. I have seen it on the Kangertech Face Book page in Rose Gold and Champagne Gold, but that was for a give away and I’m not sure if those colors will be widely available. 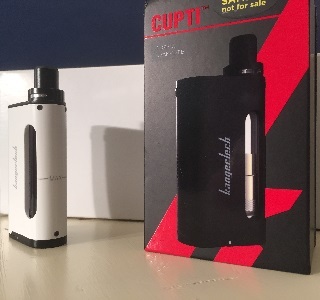 Kangertech equipped the CUPTI with all of the standard safety features, like protection against short and open circuit, cell reversal, high temperature, overtime usage and cell capacity. Quality: When I posted the CUPTI Vape Mail piece I started getting questions and comments from people hoping it didn’t have the leakage problems that the NEBOX had. I’ve been using it for almost 10 days and there has been sign of leaking. With the micro USB port on the bottom of the device I did fear that there would be some seepage when charging the device, since that placement means you have to put the CUPTI on its side while charging. And since the CUPTI has an internal tank, chances are that you’re going to have some ejuice in there while you’re charging it. But I haven’t experienced any leaking, even with the CUPTI laying on its side overnight. The other problem the NEBOX had that Kangertech addressed with the CUPTI is that slight delay with a cold coil when hitting the fire button. There is just a hair of delay with the CUPTI, but nothing like that of the NEBOX. 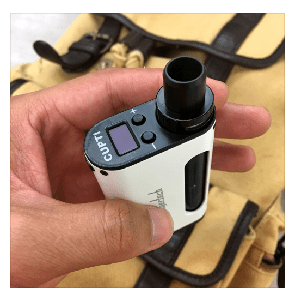 Overall the CUPTI is a solid device, firing consistently. The menu system is simple and intuitive. The LED is crisp, sharp and easy to read. The only negative is that temperature changes are in 10 F or 5 C. Kangertech’s other TC devices allow you adjust temperature in single degrees. Looks: The CUPTI is a good looking device. Its curved lines give it a lean look and make it really comfortable to hold. And with power adjustment buttons and LED on top of the device it has a really clean look. The colors are rich and the finish is durable. 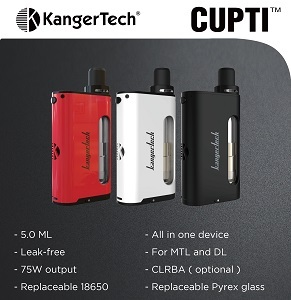 Price/Value: Kangertech lists the CUPTI at $69.90. That’s not a bad price for an all-in-one TC device with 5 ml capacity and 75 watts of power. Seven Report review product supplier and advertiser DirectVapor has it available for $59.95, which is a tremendous deal. I’ve been vaping with the CUPTI for almost two weeks with a variety of ejuices. Each flavor has been full and rich and the device produces plenty of vapor. It’s all-in-one design and 5 ml capacity makes it an excellent on the go device. If you’ve been waiting for an all-in-one, TC device but were put off by the criticism of the NEBOX, the CUPTI may be just what you’ve been waiting for. 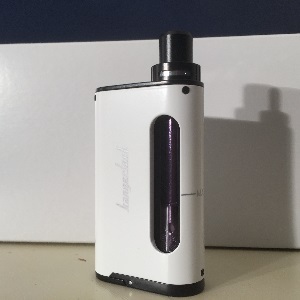 Kangertech provided the CUPTI Starter Kit for the purpose of this review. Order the CUPTI Starter Kit from DirectVapor.